Normally Texas Tech is offense first, second, and third. This year's team is much different. 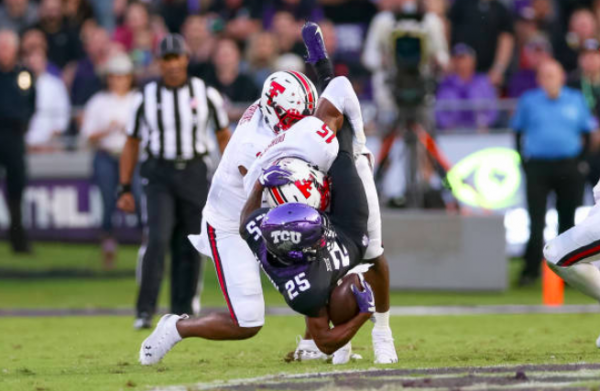 Texas Tech outlasted TCU on Thursday night in a defensive struggle that may have caught some off guard. All four of the game’s touchdowns came on big plays of 20 yards or more, which only highlights how good both defenses were throughout. The over/under for this game was about 57 points; the final total was only 31. It was still a Big 12 game, so the yardage numbers were high, but each defense cracked down when necessary. TCU managed to rack up 410 yards, but it certainly didn’t feel that way watching the game. The Horned Frogs put together drives, especially in the first half, but Texas Tech was very effective when the defense forced a third down. TCU went 5-17 on third downs and only succeeded on one of its three fourth-down attempts. Defensive plays, especially not turnovers, rarely make highlight reels, but this game should for the Red Raiders. They blitzed as often as possible on third down, and the secondary was solid enough to keep everything in front of them, with the exception of a long touchdown pass to KaVontae Turpin. That touchdown pass actually gave TCU a second-half lead, but Texas Tech scored a touchdown two possessions later on a 38-yard run by quarterback Jett Duffey. Duffey will likely be celebrated as the difference in this game. After taking two weeks ago against West Virginia–due to an injury to Alan Bowman–Duffey has kept the Texas Tech offense rolling. He certainly did a decent job in this game, and his long touchdown run was the game winner, but the TCU defense held the Red Raiders to only 17 points. The vast majority of the time, that won’t cut it against TCU. No, the story of this game has to be the Texas Tech defense. The defense was beaten badly in Week 1 against Ole Miss and didn’t look too great in Week 3 against Houston, but it was very strong against TCU. The only question is whether this is showing a trend (the Red Raiders also played very well on defense against Oklahoma State, and fixed things in the second half against West Virginia), or if TCU’s offense is just this bad (the Horned Frogs have now failed to score 20 points in three straight games). If this is a sign of things to come for the Texas Tech defense, the rest of the Big 12 should be on notice. This team has a potent offense and a solid “bend-not-break” defense. We likely won’t find out for sure until the Red Raiders face Oklahoma in three weeks, though a road trip to Iowa State in two weeks could help also. Texas Tech does have the benefit of facing both Oklahoma and Texas at home. If this defense is for real, and the offense can rebound from this game, then Texas Tech absolutely must be treated as a serious Big 12 contender.